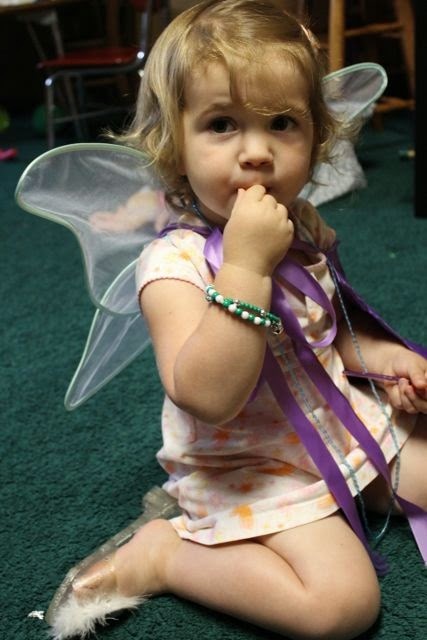 When we had our third child the response was "I am so happy for you. It is so wonderful that you now have three children. Congratulations." When we were expecting our fourth child it went a little like this, "Oh my! I am so sorry. Four kids? Whoa!" The truth is a few things have changed with four children; we had to move to a bigger house, we had to buy a bigger van, and I will be a stay-at-home dad a little bit longer. Everything else pretty much stayed the same. Our life was already in self-inflicted chaos and adding a fourth child really didn't change it all that much. All in all -- having four children is fabulous. I have four fab children. They are my FAB FOUR! 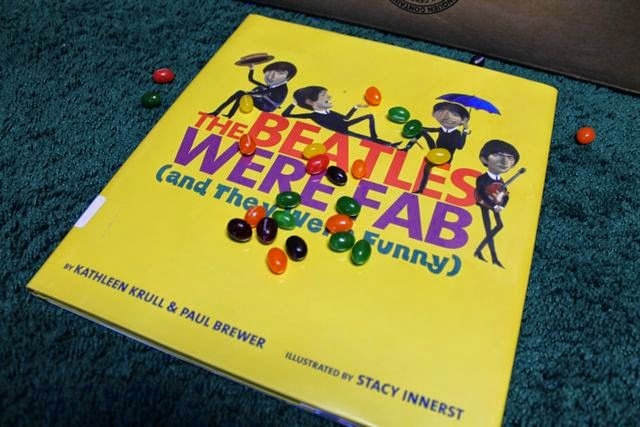 We started our birthday celebration for Kathleen Krull, author of forty books for children, by reading The Beatles Were Fab (and They were Funny) which she co-authored with her husband Paul Brewer. Reading this book taught us how quickly Beatlemania took shape and how humor played a role in the Beatles' success. We were excited to find out that the Beatles loved jelly babies, an English candy that wasn't available in the United States at the height of Beatlemania. Fans from the U.S.A. threw jelly beans on stage which were much harder than jelly babies! 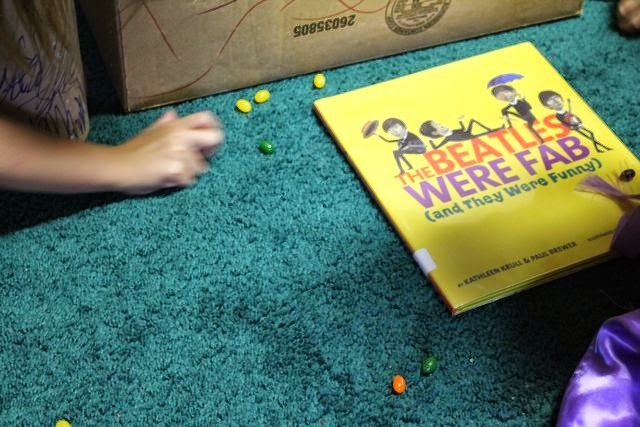 (Read an interview where the Beatles talked about how awful it was to have jellybeans thrown at them.) This book was fun to read and it inspired some creativity with my Fab Four. 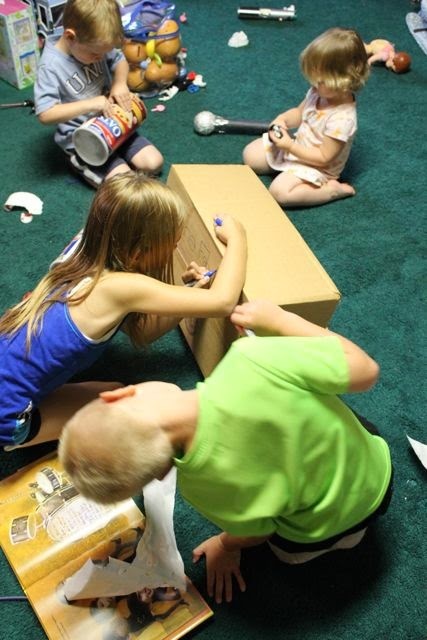 We went to the basement, turned on Birthday by the Beatles (in honor of Kathleen Krull), and started to design our own homemade rock band equipment. 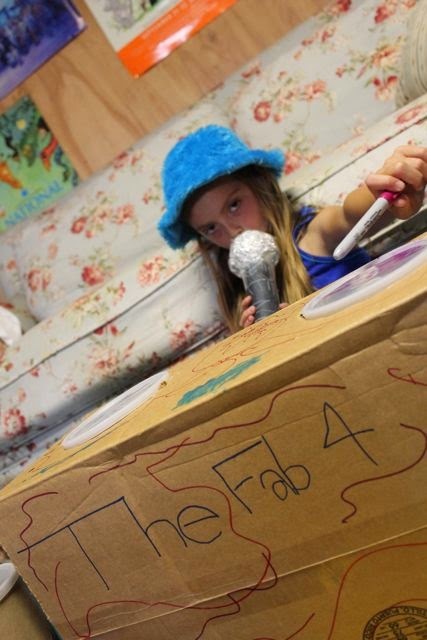 On the floor in the back, next to my daughter, you see the microphone we made from a paper towel tube, a ball, aluminum foil, and tape. Next up was the drums. 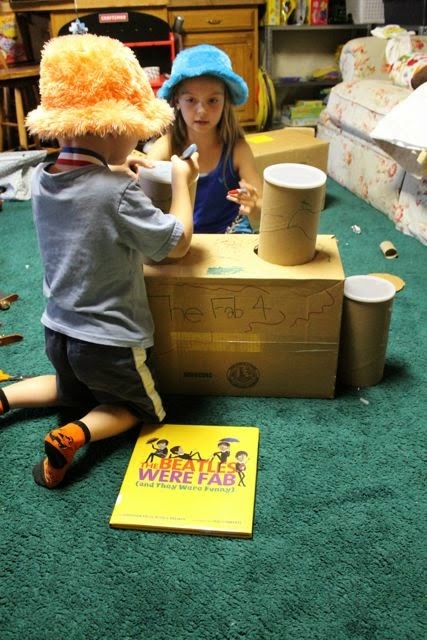 We used a cardboard box and oatmeal containers. My oldest son came up with the idea of cutting the box to insert the containers. 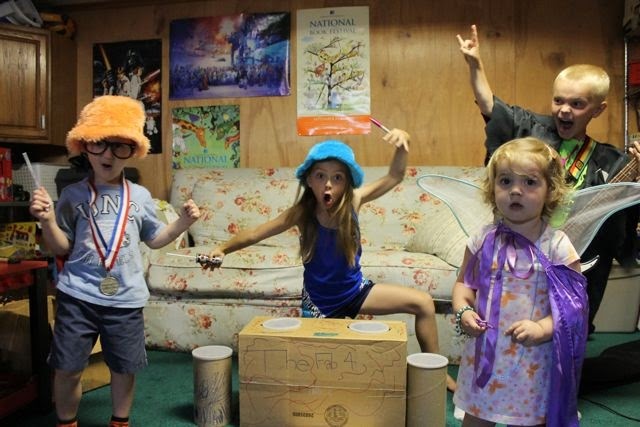 The Fab Four dressed up with items from the "Dress Up" box and were ready to rock! They are FAB (and they are funny)! "They say its your birthday! We're gonna have a good time!" Jelly beans were thrown on our stage during their performance! They said, "Just eat them!" A great book and our favorite candy! 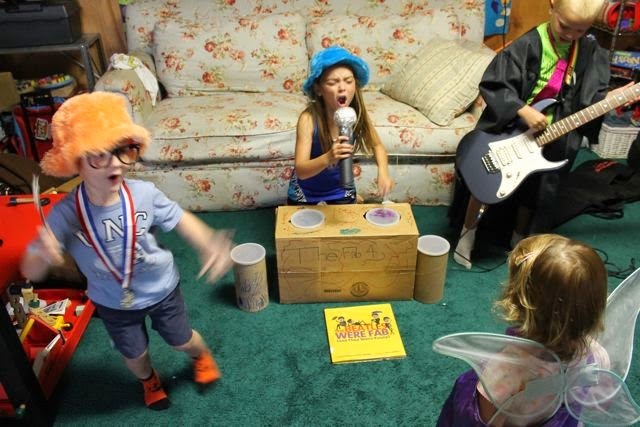 My daughter was the lead singer and the drummer! 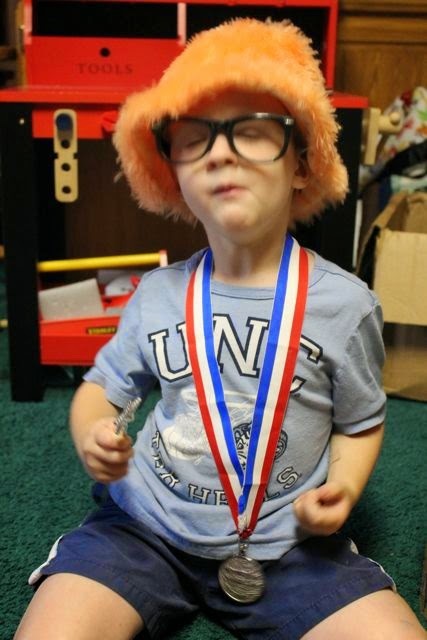 My youngest son didn't play an instrument but he sure had good dance moves. 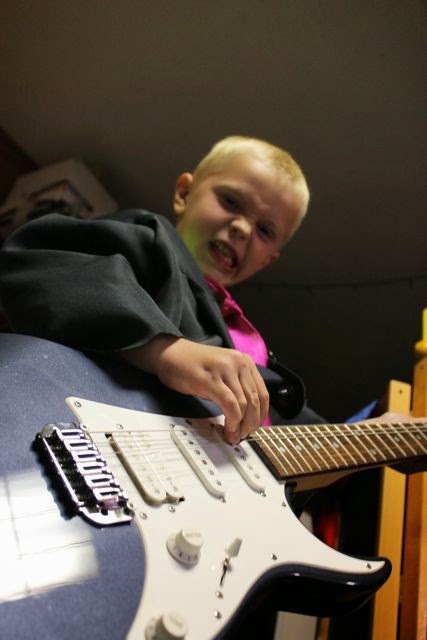 My oldest son was the lead guitarist. My youngest daughter made sure all the jelly beans were eaten. Kathleen Krull is one of the most recognizable authors writing non-ficition and biographies books for children. She continues to publish titles in the successful Giants of Science series (illustrated by Boris Kulikov) and Lives of... series (illustrated by Kathryn Hewitt). Kathleen has joked that she loves writing biographies because she is "nosy" but also notes that "biographies are stories -- dramatic, enthralling, inspirational, some of the best stories ever -- and they're true." (Scholastic). Her career in children's literature started by working as a children's book editor for eleven years. She managed to publish many books while she worked as an editor including her first book The Bugs Bunny Book in 1975. In 1984, she became a full-time writer and received numerous awards during those 30 years including the Pura Belpre Honor Award and a Christopher Award for Harvesting Hope: The Story of Cesar Chavez and the Boston Globe/Horn Book Honor Award and Golden Kite Honor Award for Lives of Musicians: Good Times, Bad Times (and What the Neighbors Thought). Her latest books are Louisa May's Battle: How the Civil War Led to LITTLE WOMEN, What's New? The Zoo!, and Lives of of the Scientists: Experiments, Explosions (and What the Neighbors Thought). 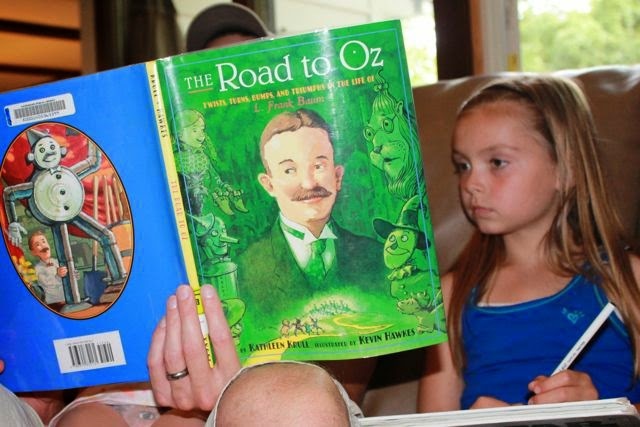 Our family enjoyed being "nosy" when we read the biography The Road to Oz: Twists, Turns, Bumps, and Triumphs in the Life of L. Frank Baum, illustrated by Kevin Hawkes. We learned that L. Frank Baum started his life growing up in a rich family, but struggled to find success on his own. He failed at many business ventures, endured many low paying writing jobs, and published many unsuccessful books. 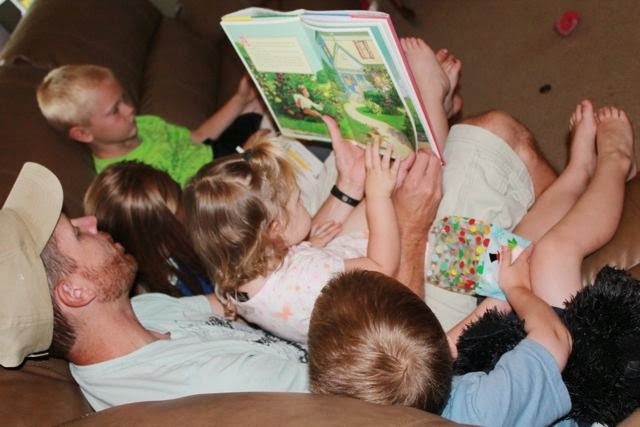 He had four children that he loved spending time with and enjoyed telling them stories. The Wonderful Wizard of Oz was a result of L. Frank Baum finally realizing he should write like he was telling stories to his children. Reading this book also made me realize that my children never watched The Wizard of Oz movie. This is one of my favorites from my childhood. I remember what a big deal it was to watch it each year when it was shown on television broadcast. 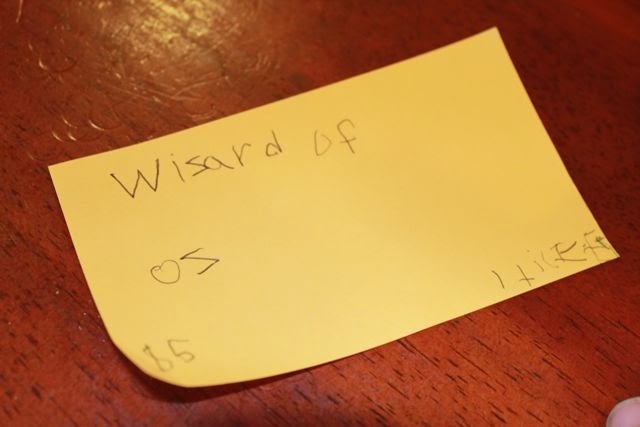 When I told my children it was almost time for family movie night my boys decided they needed to make tickets. 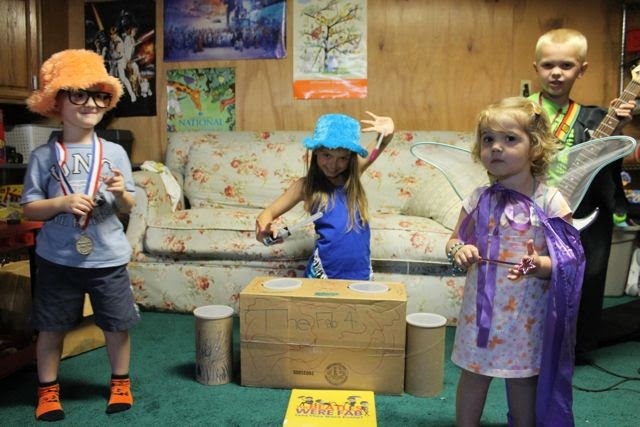 This tradition for family movie night was created by my parents when my children spend the night at their house. At my parents house they make tickets, concession signs, and the whole night becomes just like going to the movies. 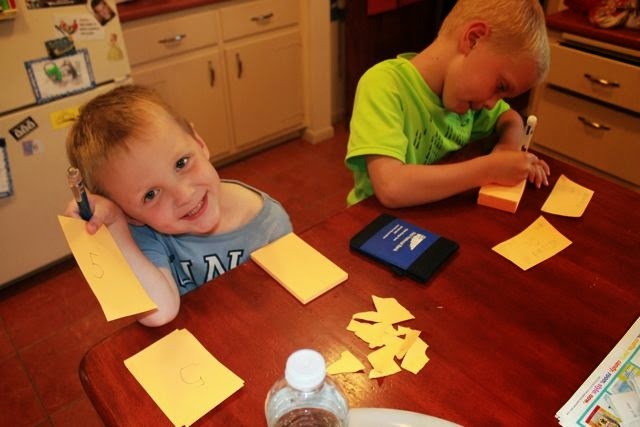 Two brothers worked together on the tickets. We read The Road to Oz together as a family before the showing. My daughter was so interested in the book that she took notes to help her write a summary paragraph for her summer reading assignment for school! 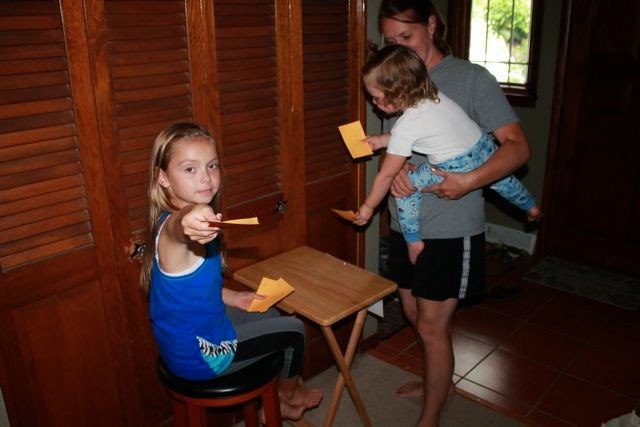 Tickets, please! Watching the movie was a great way to end a fun day of reading books by Kathleen Krull! A special thanks goes out to the librarian at our local library who went out of her way to pull out all the books she could find by Kathleen Krull. Without her we would not have discovered the two books we featured today!